Mike Eaton and his wife live in northeastern Oregon for the peace and quiet. But ever since wind turbines arrived on the ridge above their home two years ago, the Eatons&apos; slice of heaven has been a nightmare. "It makes me seasick and nauseous," said Eaton, who carries a cane. "I take medication for it, but it just keeps it slightly balanced so I&apos;m not vomiting all the time, to be honest with you." The constant swoosh-swoosh of wind turbines cutting through a downwind gust can be excruciating for Eaton. For others, like Dan Williams, who live nearby just a few miles south of the Columbia River, the sound is more than just annoying — it keeps him up at night, which causes stress. "It&apos;s like a train that&apos;s neither coming or going, or a plane that&apos;s constantly hovering, or an ocean that&apos;s not breaking or receding," said Williams, an otherwise healthy middle-aged man. "I will also sometimes get real tight in the chest and feel like I&apos;m having a panic attack." The pair recently told their stories at one of three public meetings the state Office of Public Health held in eastern Oregon to assess the possible health effects from wind turbine noise. How and at what distances sound from these giant turbines affects human beings has triggered a brush war in the search for renewable energy, a war that has seen battles from Denmark to New England to the U.S. Midwest — and Oregon. So far the issue hasn&apos;t hobbled the nation&apos;s push for wind energy, which currently generates about 2.4 percent of the electricity used in the United States. But the noise issue will likely become more salient as the search for available land brings wind turbines closer to tranquil backyards. The Acoustic Ecology Institute, for instance, describes turbine noise issues as "the exception rather than the rule" except in rural areas with neighbors within a half-mile or so. Eastern Oregon&apos;s high desert plains and notorious winds make it an ideal place for wind projects. And while overall turbine installations are down in 2010, Oregon led the nation in the third quarter, according to the American Wind Energy Association, and is fifth in the nation in its cumulative capacity from installed windmills. On the ranch land above the Eatons&apos;, about 200 miles east of Portland, Caithness Energy is planning one of the largest wind farms in the world: 845-megawatt Shepherd&apos;s Flat. The site is a giant plateau of dry grassland just beyond the Columbia River Gorge, which funnels wind gusts from the west. Towns, some with just a few hundred residents, are scattered miles apart, and counties are largely strapped. As ranching and farming get tougher each year, wind projects offer opportunities to both governments and individuals, but they also bring drawbacks. One of those is noise for people who have to live next to them. Eaton, Williams and two other households along Highway 74 southeast of Arlington have hired lawyers. They want Chicago-based Invenergy LLC, which owns the Willow Creek wind project behind their homes, to compensate them for the noise, which they say exceeds limits set by law. They&apos;re after far more than the typical payment of $3,500 or $5,000 that wind project developers typically pay neighbors that might be affected by noise. They want the company ultimately to buy their homes, which developers have done in some cases. In northeastern Oregon, where giant windmills march across the prairie, conflicts such as these are sowing negative opinions about wind energy projects. In Union County, where Horizon Wind Energy is planning a 300-megawatt project, 52 percent of voters on Nov. 2 rejected the wind farm even though it would bring jobs and millions of dollars in tax revenue. Opposition in Oregon and across the country is driven mostly by their appearance on the landscape, effects on wildlife — and fears over noise. The sound that comes off wind turbines can create a little-known side effect — dubbed wind turbine syndrome by researcher Nina Pierpont — that bothers some people up to a mile or more from the source. Pierpont was among the first to say low-frequency noise is the main culprit, although concerns about the noise are growing. Windfall, a documentary exploring the issue, debuted at several film festivals this year. The wind farm industry has largely denied any ill health effects from wind turbine noise; the British Wind Energy Association, for example, characterizes Pierpont&apos;s research as "work [that] flies in the face of decades of established medical research. … Bad science is not just misleading; it can be damaging and disruptive." A panel of experts hired by the U.S. and Canadian wind energy associations last year said the noise from wind turbines is no more harmful to human health than the average annoying sound. Setbacks less than a mile, they determined, are fine. Noise problems reported by neighbors, they said, are psychological. What exactly might be happening to people like Eaton and Williams raises questions about the way we hear. It also raises a compelling question about public policy and where to draw the line when it comes to noise. Lawmakers have tried to set the bar on noise ever since the first person complained about a nearby train track or an airport flight path. Researchers, too, have a good sense of what noise does to people. Most people can handle nighttime noise at about 40 decibels, about the same as suburban background noise. At 55 decibels just outside the home, the World Health Organization estimates a "sizable proportion of the population" could experience sleep disruption or irritability, and there&apos;s "evidence the risk of cardiovascular disease increases," according to an August 2010 report. 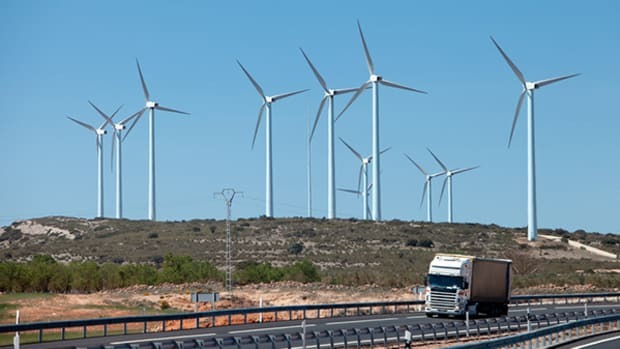 But wind turbine noise is somewhat different, with some research suggesting its palpitating swoosh is exceptionally more irritating than other sounds. One reason could be the low-frequency component. Nighttime tolerance levels for wind turbines, therefore, are generally set at 40 or 45 decibels — found at about 1,000 or 1,500 feet away from the average tower — compared to 65 decibels for airport traffic. Another study showed how attitudes toward wind turbines affected people&apos;s perception of the sound. Researchers in The Netherlands surveyed 725 people living near turbines and found "annoyance was strongly correlated with a negative attitude toward the visual impact of wind turbines on the landscape. "The study further demonstrates that people who benefit economically from wind turbines have a significantly decreased risk of annoyance, despite exposure to similar sound levels," according to the paper published last year. Dennis Wade, another homeowner in Oregon with noise problems, didn&apos;t need a scientific study to observe the obvious. "I don&apos;t know how else to say this," he told me at the public meeting in Pendleton. "If they&apos;re on the moneymaking end of it, they don&apos;t seem to hear it. They don&apos;t seem to feel it." In Arlington, where turbines flank the entire town, few people reported any problem with the noise. Mike Weedman, a Sherman County rancher with 36 turbines on his property, is decidedly on the "moneymaking end of it." And he doubts people could feel as sick as they say they do from wind turbines. "People can make themselves sick," Weedman told me. "And that&apos;s all it is. I&apos;ve been living by them for almost six years, and I don&apos;t even know they&apos;re there except for the lights at night blinking." A small group of researchers is looking into whether the symptoms of wind turbine noise could be more physical than mental. Leading this area is Alec Salt, who&apos;s been experimenting with the hearing of guinea pigs for about 10 years. The journal Hearing Research in August published Salt&apos;s paper showing that the human ear might have more acute sensitivities to low-frequency sound, like the kind produced by wind turbines, than previously understood. Salt&apos;s findings could mean that even low-frequency sound, which people can&apos;t hear, could affect them, though more research is needed to say for sure. It could also mean that low-frequency sound has a way of modulating the ear&apos;s ability to hear higher-frequency sounds, which could be one reason wind turbines are more annoying. "Even when you can&apos;t hear a sound, there are parts of your ear that are responding to it," Salt said from Washington University in St. Louis. His research essentially found that the outer ear hairs responded to low-frequency sound while the inner hairs did not. "That means sound like wind turbines can affect people or wake them up from sleep or disturb the fluids of the ear, and the levels of sound that cause these things are totally unrelated to what you hear." Most government agencies that oversee wind farms don&apos;t consider low-frequency sound when measuring noise levels. But Salt said they most definitely should, adding that based on what he&apos;s learned, it&apos;s insane to site turbines less than 2 kilometers, or about 1.3 miles, from someone&apos;s home. "The auditory science community has been asleep at the wheel," he said. Dr. Robert Dobie, an ear, nose and throat physician and clinical professor at University of California, Davis, doesn&apos;t see it that way. Dobie served on the industry panel that assessed health risks last year. He said the scientific literature is clear about sound&apos;s effect on the ear, and wind turbine noise is no different. "What debate?" Dobie wrote in an e-mail. "I do not consider it to be a high priority and would not like to see my tax dollars spent on this when there are much more important issues in medical research." Many government agencies that oversee wind farms allow them up to 1,000 feet from homes. The World Health Organization advises 1,500 feet. But neither measure would do anything to prevent what happened to the Eatons, who live almost a mile from the nearest blades. The wind energy industry, meanwhile, rejects extending this setback to, say, a mile. If lawmakers imposed 1-mile setbacks in Ontario, Canada, or the U.S. Midwest, wind energy would be nearly impossible, said Erik Nordman, a Grand Valley University assistant professor of biology who led a health assessment by the West Michigan Wind Assessment Project. Nordman examined scientific studies on sound and human health, concluding that about 1,000 feet on average was sufficient setback for most wind turbines. He also argued that the health benefits from decreased air pollution that wind energy provides outweigh the potential health side effects of the noise. Geoff Leventhall is a noise and acoustics expert based in the United Kingdom who&apos;s been working for about 40 years with people who complain about low-level noise. Leventhall served on the wind farm industry panel that concluded last year there were no health effects from turbine noise and has been pictured as a wind turbine syndrome denier by some. "What has been proven is that a person&apos;s response to noise, especially low-level noise, is conditioned by their attitude to the noise source," Leventhall said. As for Eaton, he said, "there are a very small number of people with extra sensitivities. He may be one of them. Also it could be what people are expecting to happen. One thing people have been told about wind turbine noise is that it can upset their vestibular systems, which leads to dizziness. Perhaps it&apos;s susceptibility that&apos;s been enhanced by expectation." A similar response came from Dobie, who also served on the industry-backed panel. "At levels far too low to cause hearing loss, any audible sound can, under certain circumstances, be annoying,” Dobie wrote in an e-mail. "Imagine a dripping faucet. Annoyance can also be a stressor that can contribute to illness in vulnerable people, just as other stressors such as job and relationship stress can. If I paint my house bright purple, my neighbor might find that so upsetting that he eventually suffers migraines and high blood pressure. That does not mean that the color purple is toxic." Whenever policymakers draw the line on noise, there are going to be a certain percentage of people who may still be harmed. The Federal Aviation Administration assumes 25 percent of people will still be annoyed at the sound of airplanes, despite property setbacks at airports. In the case of wind farms, it may be far fewer. Try telling that to Mike Eaton, for whom percentages mean nothing. "If this means we have to move, we have to move," he said. "What do you do when you live someplace 21 years and you have to move?"